Mother Teresa receiving the Bellarmine medal in 1981. 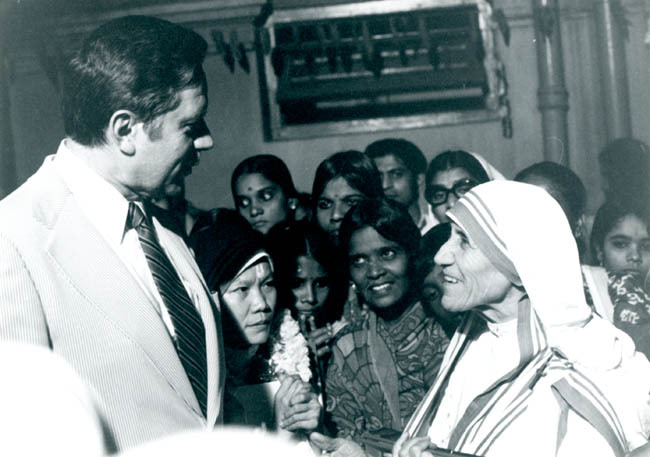 This Sub-Section includes materials related to the filming of a documentary on the life of Mother Teresa of Calcutta (now canonized Saint Teresa of Calcutta), a delegation from Bellarmine College that traveled to India for its filming and to present the Bellarmine Medal, the subsequent trip of Mother Teresa to the campus of Bellarmine as a speaker, and Mother Teresa's beatification in 2003. The documentary "Work of Love" was filmed, recorded, and produced in 1981 by Michael Nabicht and Bob Sullivan, alumni of Bellarmine. The Bellarmine Medal was awarded to Mother Teresa on December 7, 1981 in India by then-President of Bellarmine, Dr. Eugene V. Petrik. Mother Teresa came to speak at Bellarmine in June of 1982. Mother Teresa wrote in 1990 to congratulate Dr. Petrik on his retirement as President of Bellarmine. She wrote again in 1991 while Dr. Petrik was ill.
For videos of Mother Teresa's visit to Bellarmine University, visit: bellarmine.edu/motherteresa/. This Sub-Section is divided into records series. It shares a box with Sub-Section I.1. Materials were collected by Bellarmine in 1981 and 1982. Subsequent additions were donated by Helen Petrik in 2004 and by Michael Nabicht in 2010. Arrangement and description by Paul Pearson and Mark Meade. Online finding aid created in 2017.